It’s not often you come across someone with the kind of natural talent that Celeste possesses. Her vocals are pure and smooth but have a ‘roughness’ when the song needs it. Her tone and pitch is perfectly matched for country music, but it’s the energy and personality she puts into her songs that makes them (and her) infectious. The emotional connection between the artist, the song, and the audience is very important. When artists truly connect emotionally, the audience will naturally connect more fully with them. This connection is what makes an amazing artist and song. Celeste does, with no doubt, make that connection with every song she sings. 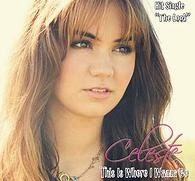 Celeste began work on her second EP (“Broken Record”) in 2012, writing all the tracks herself, and released the EP in April 2013. It comprises five tracks and ranks high on my list of ‘must-have’ music... especially if you’re a country fan! I’ve always found that artists who write the songs for an album themselves have a much deeper emotional attachment and can more easily convey that to their audiences (think Taylor Swift). Each one of the five tracks on “Broken Record” tells a story, and Celeste’s very talented and highly complex writing skills add a depth to her music that I don’t think I’ve come across before. Lyrically, the songs are so tightly packed yet not at all overwhelming or confusing. She makes use of each and every word to tell her story and to tell it clearly. “Broken Record” is just filled with energy, and you can ‘hear’ Celeste smiling while she sings... a rare quality in most music. 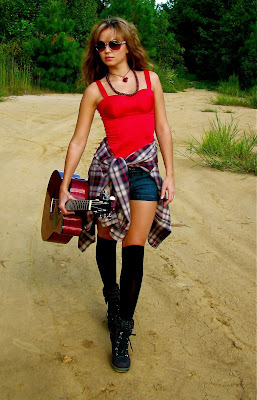 I hear influential elements from Reba, Shania Twain, and Martina McBride, but the music is wholly Celeste Kellogg. She includes everything I’ve talked about so far in each track, and yet, each song is unique in itself. Not Your Girl takes a classic country tone and infuses a youthful energy into it, which adds an additional appeal toward the younger audiences. Probably the biggest example of being able to add other musical elements without diminishing the country feel is in this song. The ‘quick-talk’ style she does in the bridge works extremely well and is nothing short of brilliant writing and arranging. Incorporating modern slang terms (“BTW OMG you’re not...) adds a deeper connection with her younger fans, but isn’t enough to turn away the older and more traditional ones... a great mix and a great balance. Celeste has fun with this song, and you can feel it. Broken Record (the video for this single is set for a January 2014 release) and Tornado are great songs, and each tells its story so well you almost feel as though you’ve lived it. Again the energy is outstanding and the country feel is absolutely dominant. Superman slows things down a little and is more personal and intimate. Celeste does a wonderful job of conveying her feelings and emotions to all who are listening. Rain, is my favorite off this EP. A simple and stripped down ballad that truly showcases the pureness and power of her vocals. She sings with a simple piano accompaniment, and her voice makes you want to stop and listen. The raw and natural talent of her vocals makes you want to close your eyes and become immersed in her world. I’ve said the emotional connection is vital in creating a hit song, well this one shows exactly what I mean. She does pick up the tempo in the bridge – but just enough and just long enough to bring absolute awareness to the feelings of the song. It’s really hard to explain, but that picked up tempo stops you from falling too far into the song. A true masterpiece of writing, arranging, and performing. Her music is fun and energetic – Her music is relatable – Her music is the future. She’s been described (by iHeartRadio) as being an “artist to watch,” and I agree... but she is also an artist to hear! And, I’m sure you will be hearing much more of her in the near future. Wow I agree. She has a very nice voice and smile!